There are so many Printer Toner Cartridges out there, it is very tough to determine what is good and what is not. 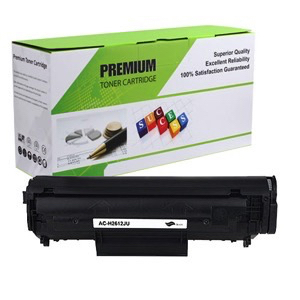 You can pay the high price for OEM produced printer toner cartridges. The problem is higher costs means lower margins on your business. So what are the choices out there for laser toner printer cartridges? These are easy. These are manufactured by OEM printer companies to be compatible for their printers. Printer companies are in the business of toner and ink cartridges because it is their “razor blade” business that was perfected by the great Gillette company. The quality of the toner output is generally quite excellent so it is a sure bet. 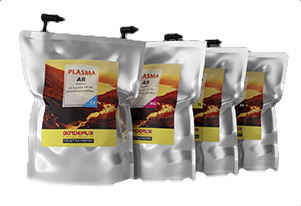 Printer companies like HP, Canon, Brother, Kyocera, OKI, Dell and others generally sell toners directly to consumers or through website retailers or big box retailers, so they are readily available at a premium cost. These are the 25%-50% off the OEM cartridges. In some cases, the quality may not be good. In most cases, this is like buying Kroger beans that are packaged by Green Giant. The same beans you are paying for at less the cost. It just has a different label on it. Lloyds of Indiana carries newly remanufactured OEM compatible toner cartridges called REVO Toners. What we like about these toners is they are OEM quality output. 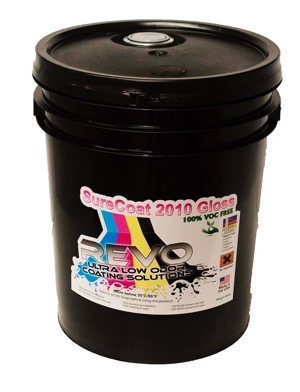 So, from a cost perspective, they are not cutting into margins because their per sheet costs is significantly lower than an OEM toner cartridge. 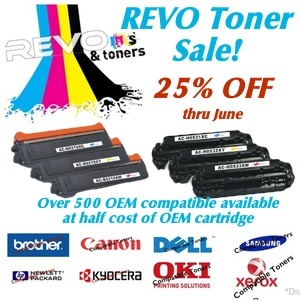 If you go to REVO Toners Cartridges at Lloyds, they are running a 25% OFF Toner Cartridges sale right now. These are the cheapest out there. You can find them on eBay for next to nothing. They can come in 3 packs at unbelievable price. The problem with these is the quality is terrible. In other words, you get what you pay for. The output tends to show streaks. They basically take a used drum and refill with toner and reprogram the chip. This is common with ink jets too. They refill and rerun. So, while it is inexpensive, it will not produce the quality you need for customers. So, our recommendation is to be wary of cheap toner cartridges. Take a look at OEM quality toner cartridges. The best value out there is finding the right newly manufactured OEM compatible to ensure you have the quality, but can improve the margins on your projects. Previous Post:Are You Outsourcing Your Document Shredding? Danger!